TFN has posted an online preview (originally at MSNBC.com) of next week’s Clone Wars episode, “Landing At Point Rain.” In it, Dave Filoni talks about the CW debut of Barriss Offee. 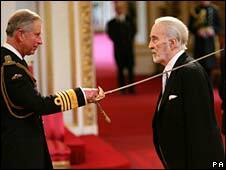 Wouldn’t it have been awesome if Prince Charles had two swords crossed at Lee’s neck like in ROTS? Long-time Anakin/Padmé site Anakin And His Angel has gone through a remodel. Go check it out! Not only were there clonetroopers onhand, but Ahsoka and Cad Bane dropped by as well. Hard to believe, but it’s already been two years since I foisted this site on the unsuspecting internets. I have been doing a lot of thinking about where to take the site next. In many ways things unfolded in a way I didn’t expect. And I have to be really grateful to Clone Wars for giving me a lot of material ;). One thing I am thinking about doing is shuttering the forum. It doesn’t have enough participation to keep it going. I have considered moving the site to Ning but I’m not 100% sure if I’ll do that or not. If there are any ideas you have, or something you’d like to see here, fire away. Now I’d like to post about some thoughts I had the other day concerning the PT and why things are the way they are online…. Movie Geek Feed has three videos of a table read featuring the cast of Clone Wars, performed at last weekend’s Star Wars Fan Days in Dallas, TX. This is similar to what they did at Comic Con in July, only with an all-new script by Dave Filoni, scrawled on the flight from California. Really! This time there’s a skit with the good guys and a skit with the bad guys. T.V.’s #1 show featured a few Star Wars references on the 10/27 broadcast, one of them a PT ref. In one scene, Abbie, the gothy forensic scientist, talks about Obi-Wan’s mentor Qui-Gon Jinn. Clone Wars’ Matt Lanter decided to drop by Star Tours at Disneyland today along with one of his co-stars from 90210…check out the photo here. No doubt all of you have picked up on these already, but we won’t tell if a couple slipped past you. One of the fun things about Clone Wars is the occasional reference to one of the movies and they’re just as plentiful this season as they were last season. Read all about ’em here.